Synthetic peptide within Rat CRF aa 1-41. The exact sequence is proprietary. 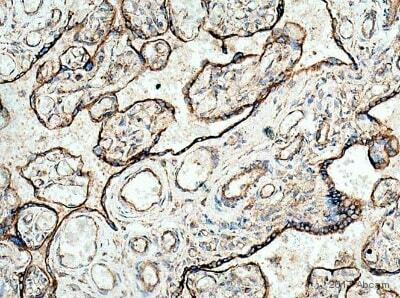 IHC-P: Rat brain tissue; Human placenta tissue. Our Abpromise guarantee covers the use of ab8901 in the following tested applications. CRF precursor is a 41-amino acid peptide derived from a 196-amino acid preprohormone. CRF is a neuroendocrine hormone secreted by the paraventricular nucleus (PVN) of the hypothalamus and is a key player in the hypothalamic pituitary adrenal axis. It is also synthesized in peripheral tissues, such as T lymphocytes and is highly expressed in the placenta. Neuronal CRF is important in a variety of diverse roles including, memory, depression, stress, kidney function, parturition, metabolism and feeding (to mention a few). Immunohistochemistry (Formalin/PFA-fixed paraffin-embedded sections) - Anti-CRF antibody (ab8901)The imade is courtesy of an AbReview submitted by Carl Hobbs. Ab8901 staining CRF in Human placenta tissue sections by Immunohistochemistry (IHC-P - paraformaldehyde-fixed, paraffin-embedded sections). Tissue was fixed with formaldehyde and blocked with 2% BSA for 10 minutes at 21°C; antigen retrieval was by heat mediation in a citrate buffer. Samples were incubated with primary antibody (1/4000 in blocking buffer) for 16 hours at 21°C. A diluted Biotin-conjugated Goat anti-rabbit IgG polyclonal (1/300) was used as the secondary antibody. Immunohistochemical analysis of rat brain tissue, staining CRF with ab8901. Tissue was fixed with paraformaldehyde, permeabilized with 0.01% Triton X-100 and blocked with 10% serum for 1 hour at 25°C; antigen retrieval was by heat mediation in a citrate buffer (pH 6). Samples were incubated with primary antibody (1/100 in diluent) for 24 hours at 4°C. An AlexaFluor®594-conjugated goat anti-rabbit polyclonal IgG (1/500) was used as the secondary antibody. The figure on the left is a secondary only control. - Day 1: Add Recombinant Protein A/G (10ug/ml) to a 96 wells plate; parafilm wrap; incubate overnight at 4°C. - Day 2: Aspirate and wash the plate to remove loosely bound Protein A/G; add antibody solution (dilution 1:50000); parafilm wrap; incubate 24h at 4°C. - Day 3: Aspirate and wash the plate to remove loosely bound antibody; add CRF standard (0, 0.03, 0.1, 0.3, 1, 3, 10, 30 ng/ml); parafilm wrap; incubate 24h at 4°C. - Day 4: DO NOT ASPIRATE; add 125I-CRF; incubate 24h at 4°C. - Day 5: Aspirate and wash the plate; break the plate and collect the wells in scintillation tubes; add 2ml of scintillation liquid; count in beta counter (open the 3H window to at least 30-40 keV), at least 2min/tube. Publishing research using ab8901? Please let us know so that we can cite the reference in this datasheet. 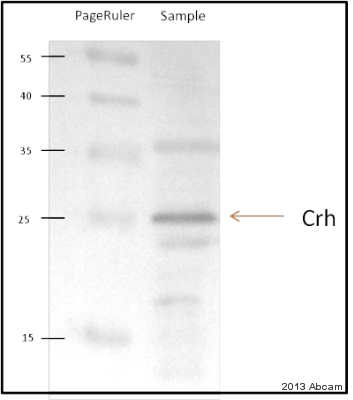 He tried this antibody on different techniques (WB, Dot Blot, IHC and IF) and no staining was observed in all tested samples and controls. See attached WB and IHC protocols tested with ab8901. For that reason, the costumer asks for antibody replacement. Please, could you attend his solicitation? Thank you for sending us your customer's questionnaire and for contacting us. I am sorry to hear this antibody is not providing satisfactory results. The details provided will enable us to investigate this case and will provide us with vital information for monitoring product quality. It is regrettable the results have not been successful. Having reviewed the protocol details, I believe this product should have given satisfactory results. I apologize for the inconvenience and am pleased to offer you a free of charge replacement, credit note, or refund in compensation. It seems as though your customer would prefer a replacement antibody, so please let me know the catalogue number and I will arrange that for you. Oh ok, this is great then. I am attaching the review so that you can process it manually, since there is no online form. Thank you for your reply. I have published your Abreview on our online datasheet and awarded Abpoints to your user account. You can view and redeem your Abpoints by logging in to your account on our website. Additionally, since you have submitted an image of an application that did not previously have an image, the discount code *** will allow you to receive a free primary antibody on your next purchase from us before September 2nd, 2012. This code can be used by anyone in your institution, and the order can be placed by phone, fax, email, or online. I hope this helps, please let me know if you need any other information or assistance. What size band does ab8901 produce for Western blotting? Thank you for contacting Abcam regarding ab8901. The predicted molecular weight of this protein is 21kDa. In WB you should detect a band at approximately this size. We are interested in the discount and will be placing the order for the 100ul vial later today. Look forward to that discount. I am very pleased to hear you would like to use ab8901 in RIA and send us your data and an image of your results. Typically, researchers can submit a product review via an online submission form. At this time we do not have an Abreview form available for submitting reviews on this product. As an alternative, please email your review of ab8901 to me. We will certainly use these papers for protocol, but neither one specifies the dilution used. The datasheet produced by Abcam indicates 1:600,000 as the recommended dilution - how was this determined? I do apologize as I have been unable to obtain any more specific information regarding the dilution of this antibody to be used in RIA. Due to this lack of specific details, I would like to offer you a testing discount, whereby you would purchase the antibody and test it in RIA and then submit your protocol and data to me which would be published on our website as an Abreview. Once that review has been received, you would be eligible to receive a free primary antibody on a future order. Plesae let me know if this would be of interest to you and I will issue you a discount code. I do apologize for any inconvenience caused. I look forward to your reply so that I may assist you further. Can you confirm the correct dilution to use this antibody in RIA? What is the recommended protocol? 1. Widmaier EP, Lim AT, Vale W. (1989) Secretion of corticotropin-releasing factor from cultured rat hypothalamic cells: effects of catecholamines. Endocrinol 124:583-590. 2. Vale W, Vaughan J, Yamamoto G, Bruhn T, Douglas C, Dalton D, Rivier C, Rivier J. (1983) Assay of corticotopin releasing factor. Meth Enzymol 103:565-577.